Where can advertisers go to effectively reach consumers outdoors where they commute, work and play? TRUCK ADS®. We offer effective and highly visible mobile ad space. TV, radio and print media have become increasingly fragmented. TIVO and other similar devices have dramatically reduced the effectiveness of TV advertising. People easily and often switch TV channels and radio stations in order to avoid commercials. They flip past print ads in newspapers and magazines and ignore banner ads on the web. Truck advertising is one media consumers can't tune out and don't seem to want to. Truck side ads are "eye candy" for everyone. You can advertise on our network of all-white straight (box) trucks and/or our long haul (big rig) semi-trailers and your ad will be more effective and attain higher visibility without visual distractions than virtually any outdoor media offered today. All-white, clean ad trucks give advertisers much more than just big ad space to display their ad. It is easier to see an ad against a big white surface (compare with bus ads) because there are no visual distractions. All-white clean ad trucks convey a positive image for advertisers, resulting in a more positive and effective ad campaign. 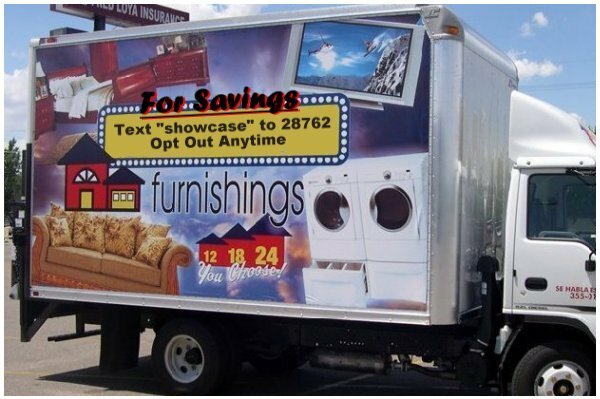 For your next out of home ad truck campaign, choose TRUCK ADS®, the brand you can trust. Place TRUCK ADS® billboards on trucks and your advertisement will be seen by 1000's of people everyday, 5-6 days a week. Attention: Advertisers who own or control your own fleet, see our fleet graphics webpage and learn how your fleet of trucks can grow your brand effectively for a fraction of the cost to advertise on the internet or newspapers. In the past 12 years, there have been a number of studies measuring the effectiveness of truck advertising. The process for each study was different, however the results for truck advertising media in motion were similar. General Motors conducted focus groups to measure audience response and estimated over 90% of the occupants in adjacent vehicles notice graphic advertising on trucks. The majority of those surveyed expressed positive impressions toward the advertiser and the brand. Their study confirmed earlier findings from tests conducted by the American Trucking Associations and 3M. Another study, by a research firm supported these findings in a recall test. Consumers said they saw the advertising on a truck while in motion and had a positive impression about the advertiser. An eye tracking study, conducted for the Outdoor Advertising Association of America (OAAA) in 1999, reveal much about how consumers observe and react to outdoor advertising. Another study, commissioned by OAAA reveals the importance of branding on outdoor display panels. Data Solutions, Inc., in 2002, studied targeting the demographics of the outdoor audience with many interesting advertising discoveries. Arbitron conducted a comprehensive examination of American pedestrian traffic, vehicle drivers/passengers, commuters and their media habits. See the Arbitron Outdoor Study. If you are looking for all white ad trucks to place your creative advertising on, or if you own a fleet of trucks or vehicles of any size or type and want to create a strong positive image with soft sided fleet graphics, call TRUCK ADS® today.